Colorado became the first U.S. state to regulate and tax sales of recreational marijuana yesterday, the Denver Post reports. Legislators levied a 15 percent excise tax, and a 10 percent sales tax on cannabis in order to pay for enforcing regulations like capping marijuana sales to Colorado visitors at a quarter of an ounce, a six-plant limit on pot gardens, mandatory child-resistant packaging, potency information and serving-size limits for edible marijuana. How grown-up! 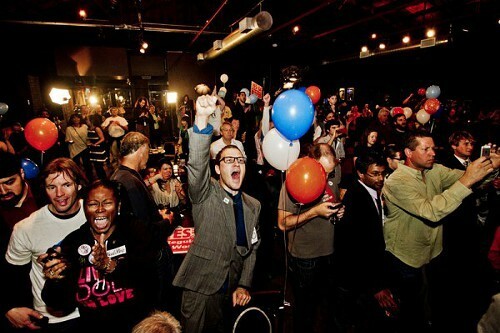 Amendment 64 supporters celebrate on election night. Colorado voters approved the legalization of cannabis for adults over age 21 via a ballot initiative Amendment 64 in November. Washington state should soon follow Colorado in crafting rules for regulating and taxing the plant. Colorado cannabis stores could be open by Jan. 1 if voters approve the new taxes at the ballot this autumn. California already raises about $100 million a year in medical marijuana sales taxes.